References m_radio100, m_radio200, m_radio75, m_radioGroup, m_radioPageWidth, m_radioPercent, m_radioWholePage, m_spinPercent, and m_windowMain. References abiDialogSetTitle(), XAP_App::getStringSet(), XAP_StringSet::getValueUTF8(), localizeButton(), localizeLabelMarkup(), XAP_Dialog::m_pApp, m_radio100, m_radio200, m_radio75, m_radioGroup, m_radioPageWidth, m_radioPercent, m_radioWholePage, m_spinAdj, m_spinPercent, newDialogBuilder(), s, s_radio_100_clicked(), s_radio_200_clicked(), s_radio_75_clicked(), s_radio_PageWidth_clicked(), s_radio_Percent_clicked(), s_radio_WholePage_clicked(), s_spin_Percent_changed(), WIDGET_ID_TAG_KEY, XAP_Frame::z_100, XAP_Frame::z_200, XAP_Frame::z_75, XAP_Frame::z_PAGEWIDTH, XAP_Frame::z_PERCENT, and XAP_Frame::z_WHOLEPAGE. Referenced by _populateWindowData(), event_Radio100Clicked(), event_Radio200Clicked(), event_Radio75Clicked(), event_RadioPageWidthClicked(), event_RadioPercentClicked(), and event_RadioWholePageClicked(). References _enablePercentSpin(), XAP_Dialog_Zoom::_updatePreviewZoomPercent(), XAP_Dialog_Zoom::getZoomPercent(), XAP_Dialog_Zoom::getZoomType(), m_radio100, m_radio200, m_radio75, m_radioPageWidth, m_radioPercent, m_radioWholePage, m_spinPercent, XAP_Frame::z_100, XAP_Frame::z_200, XAP_Frame::z_75, XAP_Frame::z_PAGEWIDTH, XAP_Frame::z_PERCENT, and XAP_Frame::z_WHOLEPAGE. References m_radioGroup, m_spinPercent, XAP_Dialog_Zoom::m_zoomPercent, XAP_Dialog_Zoom::m_zoomType, and WIDGET_ID_TAG_KEY. References _enablePercentSpin(), XAP_Dialog_Zoom::_updatePreviewZoomPercent(), AV_View::calculateZoomPercentForPageWidth(), XAP_Frame::getCurrentView(), and XAP_Dialog_Zoom::m_pFrame. 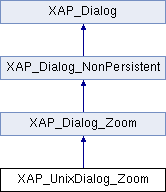 References _enablePercentSpin(), XAP_Dialog_Zoom::_updatePreviewZoomPercent(), AV_View::calculateZoomPercentForWholePage(), XAP_Frame::getCurrentView(), and XAP_Dialog_Zoom::m_pFrame. Referenced by event_RadioPercentClicked(), and s_spin_Percent_changed(). References _constructWindow(), _populateWindowData(), _storeWindowData(), abiDestroyWidget(), abiRunModalDialog(), XAP_Dialog_Zoom::m_answer, XAP_Dialog_Zoom::m_pFrame, m_windowMain, and UT_return_if_fail. Referenced by _constructWindow(), _populateWindowData(), and XAP_UnixDialog_Zoom(). Referenced by _constructWindow(), _storeWindowData(), and XAP_UnixDialog_Zoom(). Referenced by _constructWindow(), _enablePercentSpin(), _populateWindowData(), _storeWindowData(), event_SpinPercentChanged(), and XAP_UnixDialog_Zoom(). Referenced by runModal(), and XAP_UnixDialog_Zoom().